As many know, I have a long history with that current enemy of the people, the newspaper, and in particular its home delivery. As a child, two newspapers arrived daily at the end of my parents’ driveway. In the morning it was the Chicago Tribune. I can still see my dad in his leather slippers and blue plaid robe, with some odd jacket completing the ensemble, strolling down the drive, stooping to get the paper, and, a bit later there he is again, tucked neatly into a suit and tie, sitting at the breakfast table, sipping coffee, perusing the sports pages. In the afternoon it was the Chicago Daily News. Then it folded. As an adult, if in the appropriate circumstance, I too had the paper delivered. For a time I also delivered it—the Tribune, the Wall Street Journal, the Columbia Missourian. I enjoyed the job, did it well, and I cherish the memories of being about at 3 a.m., plowing through snowstorms, seeing the sunrise, gaining the ability to throw a rolled or bagged newspaper and hit my mark, playing a route against the clock, learning a new route, a new neighborhood, and the camaraderie of all sorts of us in the garage. And one morning there was that slight thrill of delivering a newspaper that contained a story I had written—in the sports pages—and in 1984, well, more than one paper I tossed up on a porch contained some jubilant or devastating story about the Cubs, and here I was, delivering it in the aftermath of my own jubilance or devastation. So no surprise that one of the joys of being back in a city is having a paper delivered right to my door. It has been placed every day inside the storm door, so, yes—right to my door. That the person doing this seems to enjoy the work, well, what more? 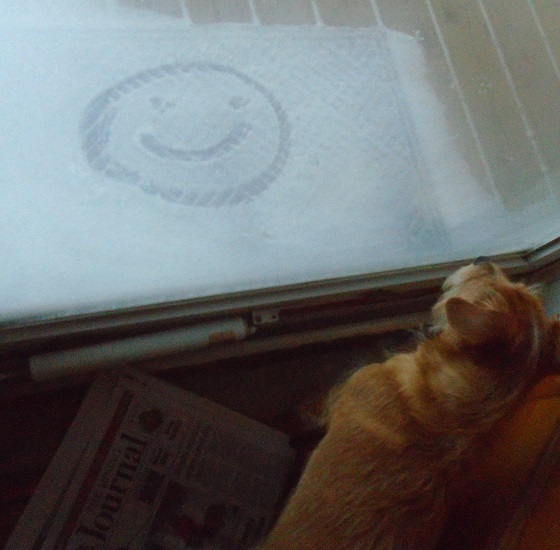 Neither Josie nor I drew the smiley face in the snow.